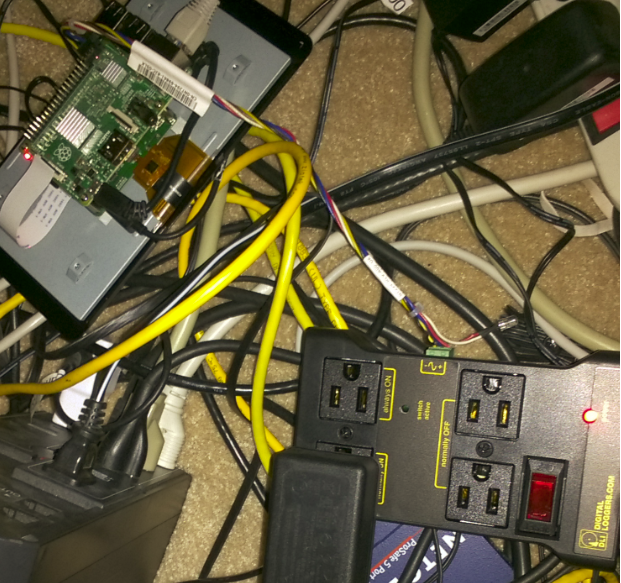 Needless to say, if I can power cycle a modem, I can control power to all kinds of devices with the Raspberry Pi. Is there a product already on the market? Why yes, there is. Normally that would shut me down in my tracks because what’s the point? But the product is relatively expensive – $100, so my DIY solution is considerably less since I already own the Pi. See references for a link to the commercial solution to this problem. This is pathetic, but, I cut out a cable from an old computer that no longer works. The jumper has more pins than I need, but I could make it work. I am plugged into the end so I need to manipulate GPIO pin 21. I put this in /usr/local/etc and called it connTest.sh. I’m still tinkering with it a bit. But it shows what we’re basically trying to do. echo "Power cycling router and waiting for $Break seconds"
# The following part always gets executed. echo "This part always gets executed"
In all this I had the most trouble getting the startup script to bend to my will! But I think it’s functioning now. It may not be the most efficient, but it’s workable, meaning, it starts up connTest.sh after a reboot, and sends the log to /var/log/connTest. So you can almost make out the different outlets from the power relay: always on; normally on; normally off. Makes perfect sense, right? See that green plug on the side of the relay? I was such a newbie I was shoving the wires into it, unsure how to make a good connection. Well, with a little effort it simply pulls out, revealing a screws that can be used to secure the wires in the holes. If the switching can work fast enough, I’m thinking of a next project with lights set to musical beats…! Raspberry Pi model 2 and 3 GPIO pins are documented here: https://www.raspberrypi.org/documentation/usage/gpio-plus-and-raspi2/. The 110 volt AC relay device, controlled by DC signal of anywhere from 3.3 to 48 volt DC, is on Amazon: https://smile.amazon.com/gp/product/B00WV7GMA2/ref=oh_aui_detailpage_o00_s00?ie=UTF8&psc=1. this is a really sweet device. Perfect for hobbyists with either Raspberry Pi or Arduino. And only $29! Product which does all this monitoring/power cycling for you automatically: https://smile.amazon.com/dp/B015NM0LKI/ref=dp_sp_detail?psc=1. But it’s $100. Another alternative which would also work is switching over ethernet. This device does that: https://smile.amazon.com/dp/B00KQ4R1RK/ref=dp_sp_detail?psc=1&pd_rd_i=B00KQ4R1RK&pd_rd_wg=dxYdP&pd_rd_r=8TBE6X2F39S2XWX9CGKK&pd_rd_w=bmvYC. There is a simple CGI URL you can use to turn power off/on. But, again, it’s more costly: $75. This entry was posted in Linux, Raspberry Pi and tagged GPIO. Bookmark the permalink.